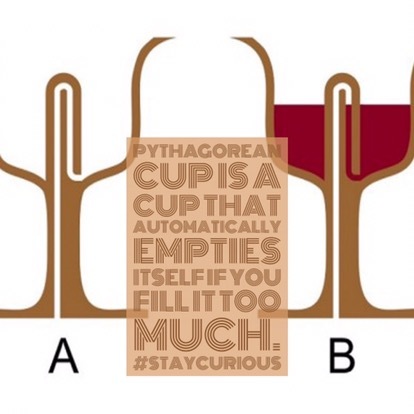 Pythagorean cup is a cup that automatically empties itself if you fill it too much. A Pythagorean cup looks like a normal drinking cup, except that the bowl has a central column in it – giving it a shape like a Bundt pan. The central column of the bowl is positioned directly over the stem of the cup and over the hole at the bottom of the stem. A small open pipe runs from this hole almost to the top of the central column, where there is an open chamber. The chamber is connected by a second pipe to the bottom of the central column, where a hole in the column exposes the pipe to (the contents of) the bowl of the cup. When the cup is filled, liquid rises through the second pipe up to the chamber at the top of the central column, following Pascal's principle of communicating vessels. As long as the level of the liquid does not rise beyond the level of the chamber, the cup functions as normal. If the level rises further, however, the liquid spills through the chamber into the first pipe and out the bottom. Gravity then creates a siphon through the central column, causing the entire contents of the cup to be emptied through the hole at the bottom of the stem. Some modern toilets operate on the same principle: when the water level in the bowl rises high enough, a siphon is created, flushing the toilet. That the Pentagon has 2 times more bathrooms than needed because it was built during segregation.